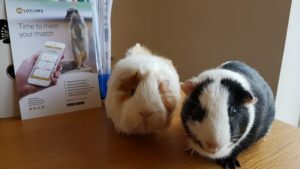 It was a big change for Bob and Barry, our rescue guinea pigs from B.A.R.K.S. Banbury, when they came to live at A1 Locums. They were adopted and collected by Sophie and Clare to come to their new home in the Northamptonshire countryside almost six months ago and they now enjoy their daily life in the bustling, lively environment. Their run takes centre stage, literally in the middle of the open plan office, with their individual coloured homes, play tubes, tepees and bowls of delicious vegetables and hay. When the weather is good, their pen is taken into the garden that borders rambling countryside. 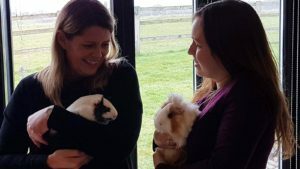 Our guinea pigs are great stress relievers, always ready to have a cuddle or sit in their tepees on staff desks, while we are working! They are curious little creatures with very different personalities. Bob is a little nervy, always looking around and careful of his steps, while Barry is the thug, bold as brass and ready to give the occasional nip in exchange for a cuddle or a hug! Barry is a Peruvian guinea pig and they are typically born with short hair and two rosettes on their hindquarters. Hair from one of these rosettes grows forward and the other grows backward. Hair below the rosettes grows downwards. As the hair begins to grow in length, it should part evenly along the spine, creating a curtain of hair around the body. He must be bathed regularly, and his coat trimmed, something which he does not enjoy. Bob is easier; a Dutch Guinea pig. Dutch is a colouration characterised by a white body with eye patches and a rump of a different colour. Although nervous, he is much lower maintenance than Barry. Barry is the boss. They keep us amused, squealing to get attention when people visit the offices but bold and happy enough to be looked upon by TC the cat and Wilbur the dog. Not only are they part of the team, they are also firmly in the public eye, having starred on leaflets, banners and social media posts for A1 Locums. Since getting our pair, Ryan has joined the veterinary recruitment team and so taken by the guinea pigs when he arrived, he has now adopted two guinea pigs himself, dad and son, Finn and Jake. If he had not taken them from a breeder, they were going to a rescue centre, but Ryan stepped in and now they too, have their forever home. Our third charity to benefit from a Christmas donation from A1 Locums is Saving the Survivors, which is our international favourite. One of our locums is working with the charity and doing a superb job in helping save some of these wonderful beasts. 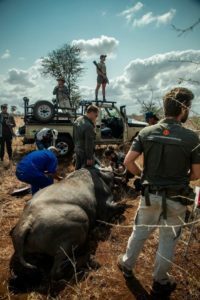 Saving the Survivors was founded in 2012 by Dr Johan Marais to attend to injured endangered wildlife that have fallen victim to traumatic incidents. The charity has three vets, Dr Johan Marais, Dr Zoe Glyphis and Dr Andy Fraser. Due to the escalation in poaching incidents, the number of victims is rapidly increasing. Fortunately, many poaching victims have been given a second chance after undergoing various interventions and surgical procedures performed by the team. Most of these animals are treated in their natural habitat as transporting injured wildlife increases the risk and trauma they experience. Joao Simoes de Almeida, one of the vets who is involved in this charity, started working as a locum with A1 Locums in 2014. 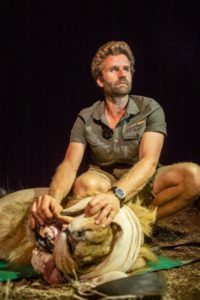 He says “One of the most important moves in my career as a wildlife vet was moving to London and completing the MSC in wild animal health with the Royal Veterinary College and the Zoological Society of London. This was only possible because I had the full support of Clare and Sophie from A1 locums, they worked tirelessly with me to find locum work in small animal practices around London that would ‘fit’ my masters schedule. The locum work allowed me to pay my bills that year and complete the MSC successfully while improving my clinical skills in the competitive small animal practice world in the UK. A1 Locums are pleased to support this charity and we hope that our donation can go towards a piece of necessary equipment to help this amazing charity. A1 Locums is delighted to announce the name of the second charity that will benefit from donations this Christmas after a decision was made to support a charity rather than send cards and gifts. Cocker and English Springer Spaniel Rescue believe that every Spaniel should have the opportunity of a happy and fulfilled life in a loving home and that everyone who owns one, should have a positive experience and one that enhances their quality of life. This was the aim of two retired couples, who having worked for a previous charity, set up Cocker and English Springer Spaniel Rescue in March 2010. Passionate about the breeds and owners of many dogs, they wanted to ensure that these loving breeds found the best possible homes. In August 2010, CAESSR gained Charity status and are now recognised by the Kennel Club and listed in the Kennel Club Rescue Directory. The charity, with its network of volunteers, has been able to expand its operation from its initial starting point in the Midlands, to throughout the country. It has a team of rehoming folk, who go out and check that the new homes would be suitable for the dogs which are to be rehomed. They are also supported by a band of foster parents and homes, as well as the support of two kennels. Some dogs are better suited, because of age, illness or trauma, to go into a foster home, rather than kennels. 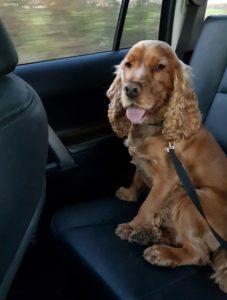 CAESSR is constantly raising money to cover the monthly veterinary and kennel bills; the latter can be over £1,000 per month, plus veterinary bills, grooming bills, transportation and supporting the foster dogs, who without the charities support, would not be rehomed. The veterinary bills are also a large cost of the care, with bills between £1,000 to £4,000 per month. For our elderly dogs and those with long-term illness, the charity supports them where necessary through their lifetime. A dog with a pacemaker or long- term heart surgery, can be draining on the charity, but with the help of donations, this amount is met. A1 Locums has a special interest in this charity as one of the A1 team, Anna Robertson, volunteers as a rehomer, going out and chatting with couples and families, looking to take on one of the dogs from the charity. She said “I have worked with the charity from the beginning, having taken on a 5-year-old springer, who was adorable one minute, but had aggression tendencies. The group helped us and supported us with training and advice from a gun dog trainer and some good veterinary advice. We had Digger for 10 years and we finally said good-bye to him at the age of 15 in July. John Powell for the charity, was delighted that A1 Locums were going to donate to the charity and assured them the money would be well spent! A1 Locums is a specialist recruitment agency for the veterinary sector, placing vets and nurses in jobs throughout the UK. This Christmas, instead of sending gifts and cards, A1 Locums has nominated three different charities to support. As a recruitment company that specialises in veterinary placements, we feel it is only right to choose animal charities! The first charity we will be supporting is B.A.R.K.s Banbury. 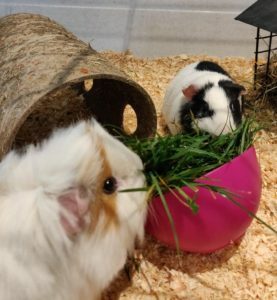 It’s been four months since we adopted our two gorgeous guinea pigs, Bob and Barry from this charity and the boys have brought us nothing but joy. They happily keep our staff amused with their antics. Both have settled in well and are very chatty! They’re a special addition to our office team, and can frequently be found on the lap of a staff member, wrapped in a cosy blanket. They’ve each made their modelling debut too, having been featured on the company leaflet and on many social media posts. Ann from the B.A.R.K.s charity says “Thank you so much to A1 Locums. BARKS’ main expenditure is medical bills, typically £2000-£3000 per month, covering neutering, vaccination and of course health issues. We neuter all domestic animals and vaccinate all cats, rabbits and puppies (we only handle a small number of dogs, all youngsters). With such practical needs and recognising the excellent work they do, A1 Locums is proud to be supporting this worthy charity. More on our next charity very soon. "You are amazing!!!! Yes, of course, please book me in. Thank you so much for your help! First of all, I'd like to thank you for your support over the last couple of years. I'm keen to continue working with you in 2018 as and when you need me. Many thanks for your continued business and support. Thank you so much Clemency for your help. "